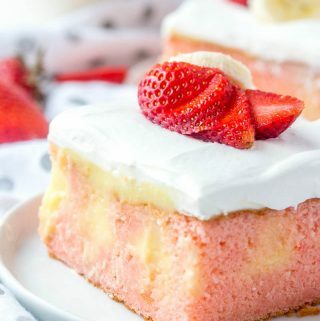 Easy and delicious this Strawberry Banana Poke Cake is a flavorful, fun and unique dessert that combines two iconic flavors into one! Spray a 9"x13" cake pan with non stick cooking spray. In large bowl beat together cake mix, butter, milk and eggs. Pour into prepared cake pan and bake 35-40 minutes until center is set. Remove from oven and immediately poke holes in top of cake with handle of wooden spoon, set aside. In another large bowl whisk together pudding and milk and pour over cake, spreading to make sure the pudding gets down into holes. Spread evenly over the top. Cover and refrigerate for 3-4 hours. Remove from refrigerator and spread whipped topping over the top of cake. Top with sliced strawberries and bananas if desired.